A healthy smile is important – not only to oral health, but for overall health, too. Did you know a dentist can detect more than 120 symptoms of non-dental diseases—including cancer, diabetes, heart disease, kidney disease, and osteoporosis—during a routine oral exam? A dentist may be the first line of defense in diagnosing health problems that could be more costly in the long run. Having dental coverage helps people stay healthy. It can also help keep overall health care costs down. After all, good health starts with a healthy smile! Medicare itself does not cover routine dental, vision or hearing exams or copays related to the health of your eyes, ears and smile. 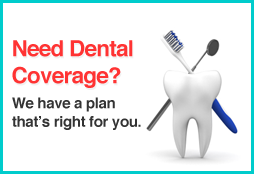 Most Medigap plans also do not cover any routine dental, vision or hearing. So often I get asked What about Dental or Vision? and Whats the Best plan? Well we represent many options. So click on each one and when you are done you probably will find one thats Right for you.. If you need additional help we will be glad to sit down and fully explain the ins and outs of these plans. Otherwise you can click on the links and Direct Enroll! We offer Dental Coverage in Two (2) different Models. can be incurred when using an in-network dental provider. Many people wonder how discount dental plans can be so cheap but still offer such significant savings. "What's the catch?" they say. That's a question we hear all the time. Almost everyone understands how traditional dental insurance works because it's so common. But, this is not dental insurance. Our plans cover more than 100,000 dentists nationwide. These quality providers have agreed to charge reduced fees on the dental services you need. So you'll get the quality care you deserve at a bigger savings than you ever imagined possible. My website for my Discount Dental Plans..
Not only do they offer Dental and Vision but they have a Medicare supplement that has a Dental and Vision Rider.